KIEV, Ukraine -- Ukraine's press freedom has declined since the election of the new Russia-friendly president earlier this year, a global media rights watchdog said. Freedom of the press, in Ukraine, has declined since the election of Viktor Yanukovych, as president. Paris-based Reporters Without Borders said in a statement issued Thursday that the ex-Soviet nation has seen a return of intimidation and physical attacks on journalists and abuse of authority toward the media over the past three months. The group expressed concern about Ukrainian President Viktor Yanukovych's decision earlier this month to disband the national commission on freedom of speech. 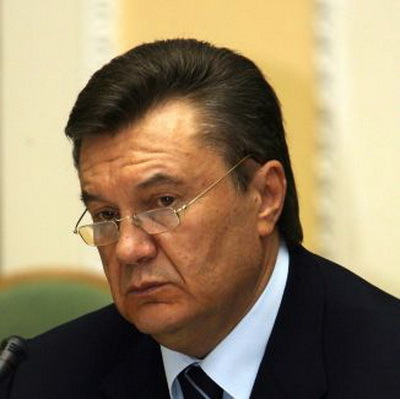 It urged Yanukovych to explain his move and spell out his media policy. The UNIAN news agency quoted Yanukovych's deputy chief of staff, Anna German, as saying Friday that the commission's functions were given to a newly created body that she heads. Yanukovych was elected on Feb. 7, unseating his political rivals who were catapulted to power by massive 2004 protests against election fraud dubbed the Orange Revolution. He campaigned on a promise to expand ties with neighboring Russia, which badly worsened under his pro-Westerm predecessor, Viktor Yushchenko. The media watchdog said Ukraine had risen significantly in its press freedom index in recent years, but positive trends have reversed since Yanukovych's election. "Reporters Without Borders urges the president to uphold freedom of the press, which is enshrined in Ukraine's constitution and in various treaties and conventions that Ukraine has signed," the group said. "He must change his approach to the media and restore the trend of the past few years towards greater media freedom." " UKRAINES PRESS FREREDOM DECLINES"
THIS STORY MUST BE ADDRESSED IN A SERIOUS MANNER!!. FIRST.. I an American journalist who also covered news developments in the Ukraine and some in Rusaia when based in KYIV Ukraine. The news organization I represented was and still is PATRIOTS TV and PATRIOTSTV.COM. I still work as cheif investigative reporter and producer for PATRIOTS but also THE PHILADERLPHIA BULLETIN newspaper in Philadelphia,U.S.A. With relevance to this article written by an Associated Press reporter I am terribly upset. President Yanukovich doing a good job in the U.S.
speach has been disbanded and that the duties were given to a new commission which she heads. FIRST-She and the Yanukovich administration must read the constitutional law regarding freedom of speach and news reporting in UKRAINE. people of Ukraine to know TUE FACTS. I have had the pleasure of working with and knowing Andry Tsapliyenko of INTER TV NEWS who has been rated one the top investigative journalists in all of Europe for his documentaries and reporting. are among the best as are those of KYIV POST reporters. The Yanukovich regime needs to know that you do not start disbanding " freedom of speach" or reporting factual news by legitimate news agencies worldwide and have honorbaly represented Ukraine. come to Ukraine to report. .Recently I wrote a commentary on behalf of the French news agency Reporters without Borders from France. ....I do not know the specifics of the incident in which the reporters were detained and content conmfiscated. confiscated. ..The KYIV POLICE work hard and do a good job but they follow their orders from superiors. ..I have written the chief editor of Reporters Without Borders on this. Yanukovich administration as a serious violation of all media reporters worldwide with their reporting relevance to justified news in Ukraine or what impact such events may have on international reporters with relevance to Ukraine or other countries and people or people such as the United States. agencies may regretfully enter possible litigation as a violation of the rights of the people of Ukraine and others who visit and report there. The international media has honorably represented Ukraine bud the current administration needs to think seriously if it wants continued,positive news coverage. The President and his staff is to represdent the people,of Ukraine- and it works for them by the nature of their vote otherwise their vote is meaningless. Ukraine has developed a great reputation for creative news reporting and it must be protected..